The ASEAN summit hosted by Australia in Sydney on 16 and 17 March provided the Institute with a number of opportunities to support this significant Australian-hosted event and to extend public knowledge of ASEAN-related issues. 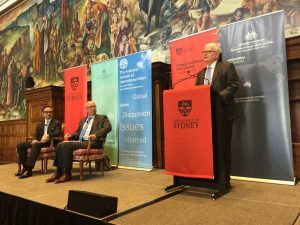 On Monday 12 March, AIIA NSW co-hosted with Sydney University and the Department of Foreign Affairs and Trade an address by Dr Marty Natalegawa, Foreign Minister of Indonesia from 2009 to 2014, followed by a discussion with Sydney University political scientist Dr Michael Vatikiotis. Dr Natelagawa said ASEAN had achieved real regional cohesion in its fifty years so far, but needed to find greater security relevance in the face of geo-political and geo-economic shifts. It needed to avoid the trap of choosing between China and the United States in its strategic orientation. It needed to be more ambitious in offering a vision for the wider region, while avoiding the risk of losing effectiveness if membership were expanded too much; asked about a media report that the Indonesian President had said Australia could become an ASEAN member, he said this was not a central issue and was not being sought by Australia. He endorsed the renewed Indo-Pacific strategic focus, noting that the annual East Asia Summit (EAS) brought the ASEAN countries into dialogue with Australia, Japan, China, India, South Korea and New Zealand. A proactive ASEAN role would help avoid Indo-Pacific discussion being hijacked by a cold war mentality. Progress needed to be made in developing an ASEAN capacity to address internal problems in member countries, such as Cambodia: it was not enough for other member countries, including Indonesia, just to give a blanket veto to any attempt to address such issues. He agreed with Dr Vatikiotis that the European Union provided a model for greater integration, though there were major differences between the two regions, notably the much more substantial level of economic interdependence in Europe. On Wednesday 14 March at Glover Cottages, AIIA NSW (with support from national office) hosted a meeting of the Australia member committee of the Council for Security Cooperation in the Asia-Pacific (CSCAP), extended to include foreign ministry, think tank and media researchers from Malaysia, Thailand, Singapore, Indonesia and Vietnam. Participants from the AIIA were NSW President Ian Lincoln, Vice-President Thom Dixon, councillors Michael Lee and Colin Chapman, and AIIA Fellow and former NSW President Geoff Miller. AIIA National Communications Officer Annabel McGilvray conducted interviews with two of the participants, published in Australian Outlook. The meeting was co-chaired by Ric Smith, former Secretary of the Department of Defence and Ambassador to China and Indonesia, and Professor Tony Milner, Professor Emeritus in the School of Culture, History and Language at the ANU College of Asia and the Pacific. Discussion focused on the ASEAN Regional Forum (ARF). The world had changed in the 25 years since the ARF was established. It remained relevant as a talk shop with a focus on practical outcomes, including working groups operating out of the limelight on potentially-divisive resource issues. The ARF had established a continuing role as one of a number of security-oriented forums associated with ASEAN. The renewed focus on the Indo-Pacific had added an additional dimension to ARF deliberations without detracting from its relevance. Australian participants underlined the need for Australia to renew the vigour in making ASEAN and Southeast Asia its priority for economic, political and security cooperation. Lively input from the Malaysian, Vietnamese and Thai participants emphasised ASEAN’s commitment to guiding its own destiny. On Friday 16 March AIIA NSW President Ian Lincoln was invited by the Thai Embassy to participate in a round-table on issues for the summit, including Indo-Pacific strategic and regional security issues, chaired by the Permanent Secretary of the Thai Foreign Ministry, Mrs Busaya Mathelin, and including Dr Suriya Chindawongse, Director-General of ASEAN Affairs in the ministry (who addressed the Institute on 22 February on issues arising for ASEAN during Thailand’s period as ASEAN chair from 2019) and Ms Thippawan Supamitkitja, Deputy Chief of Mission at the Thai Embassy in Canberra. The other Australian participants were Aaron Connelly, Research Fellow in the East Asia Program at the Lowy Institute, Dr David Brewster, Senior Research Fellow at the Australian National University and Richard McGregor, Senior Fellow for East Asia at the Lowy Institute. Discussion centred on the prospects for ASEAN over the next fifty years. Regional interactions were undergoing reassessment and expansion: was the East Asia Summit still relevant? How would the Quad (US, India, Japan, Australia) interact with ASEAN? Would a growing focus on security diminish ASEAN’s role, or create division? There was a danger that new regional structures might weaken ASEAN cohesiveness. Would ASEAN and the EAS find a role in resolving wider issues – China’s increasing regional interventions, Japan’s strategic muscle-flexing, the Korean peninsula? There was new interest in India’s role as a dialogue partner, though this always brought in the complexities of relations with Pakistan. Indonesia was becoming more active in ASEAN and East Asian issues more generally. Political Islam was an increasing concern for ASEAN members, including the problem of foreign fighters. From an Australian perspective, summit outcomes included substantive results covering counter-terrorism, business and political engagement, in addition to the strong political signal of closer Australian engagement with ASEAN.